I love soup. It’s such a comforting meal with endless variation options. Homemade soup = true soul food. It is especially great during cold seasons and in cold climates, but I’ll have it any time, no matter what the weather is like. I grew up with a typical warm lunch that always consisted of soup as a starter and a main. Often times the soup itself was filling enough and because there are so many different kinds of soup, there was always something new to look forward to. My mom is very good at making soups and as a younger girl I watched her closely while she was preparing them. Later on I started to adapt her recipes to healthier versions, leaving out some ingredients and adding a bit of my own. This broccoli coconut cream soup is a simple, healthy and 100% plant-based version of her creamy broccoli soup. It doesn’t contain any stock or added flavoring and instead of creme fraiche and butter, I use natural coconut cream. It’s perfect for vegans, people who eat dairy-free and any soup-lover out there! Broccoli is very healthy. One big cooked broccoli contains about 182 mg of vitamin C, 395 mcg of Vitamin K, Vitamin A, Vitamin E etc. 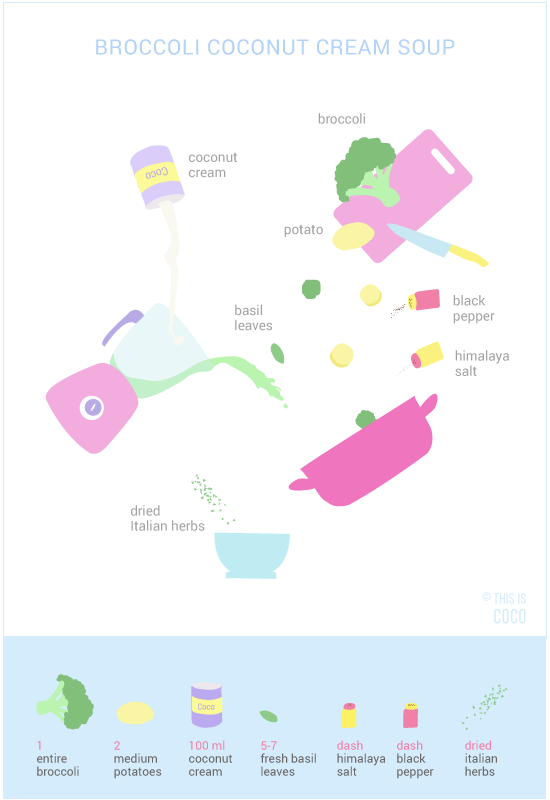 The fat from the coconut cream is packed with healthy fatty acids and helps with the absorption of fat-soluble vitamins A and K.
I explain more about how coconut oil and coconut milk help with nutrient absorption. Making this broccoli coconut cream soup doesn’t require any special skills or much preparation, anyone can make it. Wash the broccoli and the potatoes. Cut the broccoli and the peeled potatoes in small pieces and add them to a pot with boiling water. Small pieces cook faster, which retains more of their nutrients. Plus it’s convenient when you’re hungry! Cook the vegetables for about 20 minutes or until they are soft, but still firm. Remove from heat and mix with a hand mixer until you get a nice purée. You can also use a food processor or blender, whatever you have at hand and works for you. Put the pan with the purée back on low heat. Mix in the coconut cream, salt, black pepper, Italian herb mix and the fresh basil leaves. Cook it on low heat for another 10 minutes. 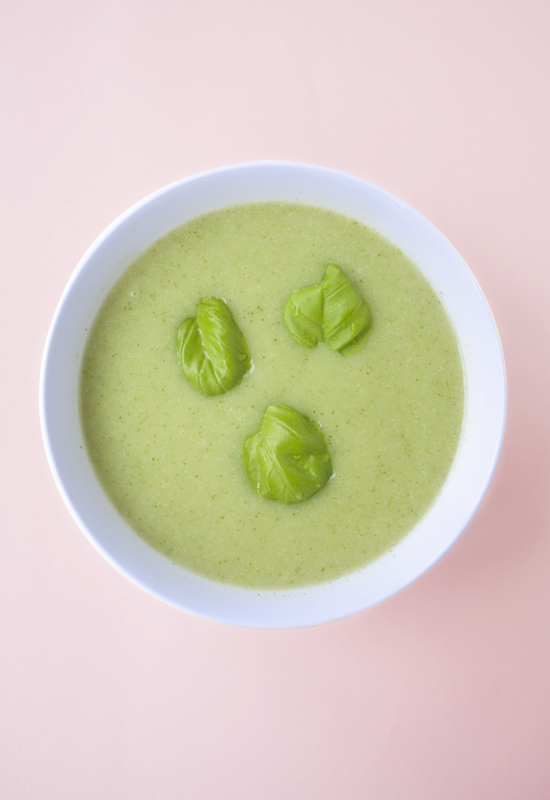 Serve the broccoli coconut cream soup while it’s hot with some fresh basil leaves on top.